This means I'm seeking the first three-dimensionally computer-modeled and rendered imagery used in Star Trek. We know there was extensive 3D CGI used in DS9 (Odo) and Voyager (USS Voyager). But what is the earliest use in TNG or any of the TOS movies? Note that to satisfy this question, there needs to have been a meaningful model built in 3D and then rendered, as I'm sure there was a lot of post-processing done by computer in TNG and there were many 2D images generated for effects (e.g. Okudagrams) and the line between what would constitute computer-generated 2D images and merely digital image manipulation would be kind of blurry. Manually generated images from multiple views that were meant to appear 3D do not count. The very first CGI used was in Star Trek II: The Wrath of Khan, where Lucasfilm Graphics Group, then a subsidiary of Industrial Light & Magic (ILM), was responsible for the "Project Genesis" demonstration sequence effect, the very first fully textured 3D CGI representation shown in the motion picture business to a general public. 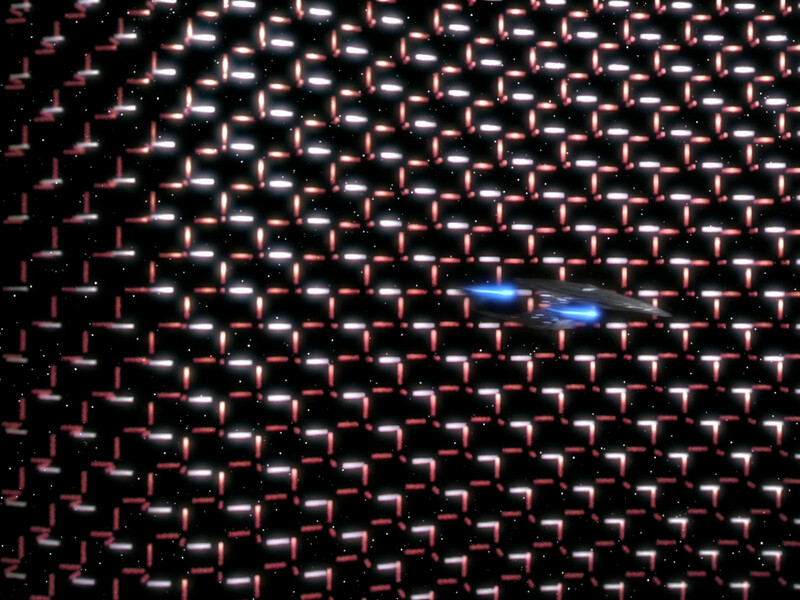 With regard to TNG, the first explicitly CGI object seen in the show is the gigantic force-field erected by Q at approx 4 minutes in. We have confirmation (from Wil Wheaton, the actor who portrayed Wesley Crusher) that this was indeed a computer-generated effect rather than a physical model or a video-effect. "There's a mystery at Farpoint, and he's totally going to solve it...just as soon as he figures out how to get past this giant CGI net that's arrived out of nowhere and is cockblocking his ship." In its very first appearance, the Crystalline Entity was one of the very first CGI sequences used in the Star Trek franchise. It was built and rendered by Chris Alsop at The Post Group. Not the answer you're looking for? Browse other questions tagged star-trek star-trek-tng history-of star-trek-tos cgi or ask your own question. What does this blurry technobabble on the Project Genesis Summary splash screen say? Was the font used in the Star Trek wordmark created for the show, or was it a re-purposed font? Was the first pilot episode of the original Star Trek inspired by Bradbury's Martian Chronicles? Were seat belts used in Star Trek for the first time in Star Trek Beyond? When and what was the first Star Trek scene ever filmed?